Read this report by Forrester Research, Inc. for a better understanding of customer life-cycle marketing systems, a look at the landscape of CLCMS technology providers, and key recommendations for CMOs to prepare for and adopt these new but necessary tools. Fragmentation of the customer journey, due to the growth of digital channels, platforms and content, has forced marketing to be more relevant and responsive. 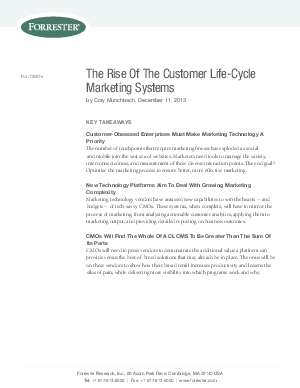 In this paper, Forrester calls on CMOs to adopt the customer life-cycle as a guiding framework and deploy “customer life-cycle marketing systems” (CLCMS). Learn more by downloading the report.